Plastic Sheds - Who Has The Best Plastic Sheds? 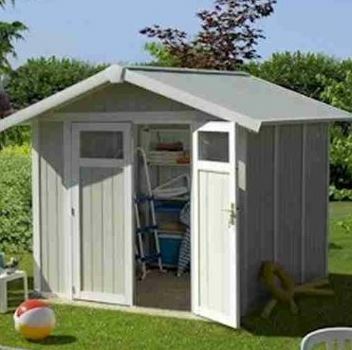 Plastic sheds come in all sizes and styles, so there really is a plastic shed to suit everyone. That makes them one of the most flexible garden buildings of them all, as well as one of the most practical as once installed they are virtually maintenance free. With so much choice, selecting the right one for you and your garden might seem daunting. 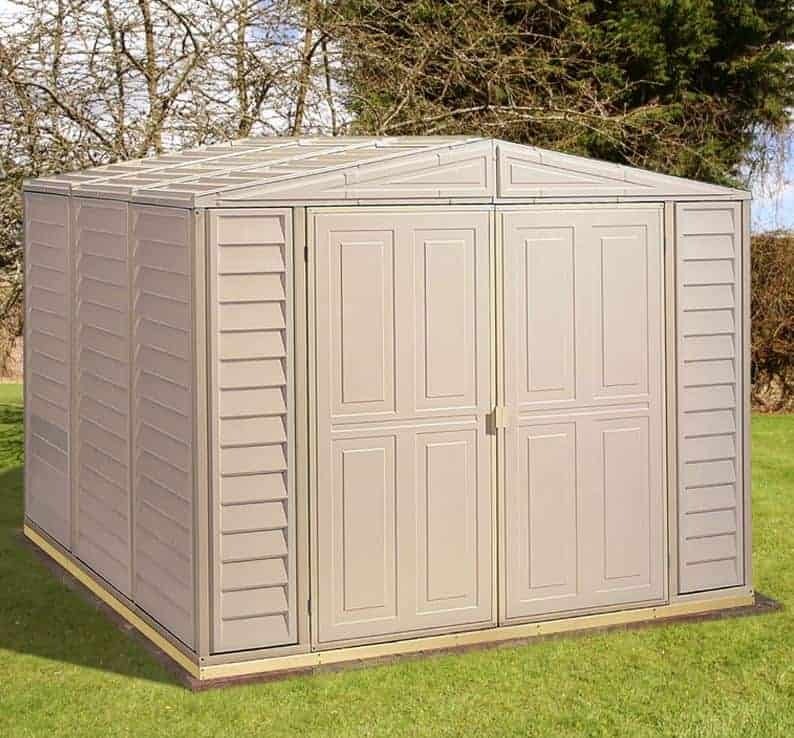 That’s why WhatShed have created this handy guide to the very best plastic sheds that can be bought online in the UK today. In a moment we’ll reveal the criteria we used to select and then rank the plastic sheds within our league table, but we considered price and value, aesthetic appeal, durability, and value adding features such as extended warranties, among other factors. Plastic sheds are becoming increasingly popular, and it’s easy to see why as they offer a winning combination of affordability, toughness, and practicality. We were also pleased to see an increasing number of plastic sheds that offer unique colour schemes, or that have a distinctive look of their very own. With so many to choose from, selecting only twenty for our league table was difficult, but we narrowed the field down by discounting unimaginative sheds and those that lacked an extended warranty, and we also discounted garden buildings that were over ten foot by eight foot and therefore primarily designed as workshops. In such a diverse category, selecting the overall winner was not an easy task, so it’s well done to the BillyOh Retford apex shed. 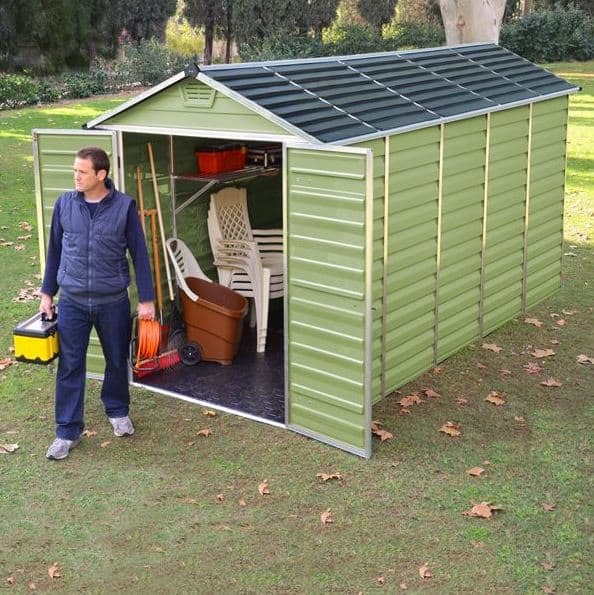 Thanks to its attractive colour scheme and fantastic value, along with the added bonus of a foundation kit, it earns a place at the very top of our guide to the UK’s twenty best plastic sheds that can be bought online in the UK today. Whether you’re looking for metal, wooden or plastic sheds, WhatShed’s independent reviews can help you make a great purchasing choice. If you thought that plastic sheds all looked the same, or that they’re invariably white and dull, then this eight foot by five foot Retford shed should make you think again. We were very impressed by the light amber brown colour scheme applied to it; it’s a unique colour that catches the eye and helps it stand out against its competitors. We were even more impressed by the asking price of under three hundred and fifty pounds, especially as it comes with a 15 year manufacturer’s guarantee. 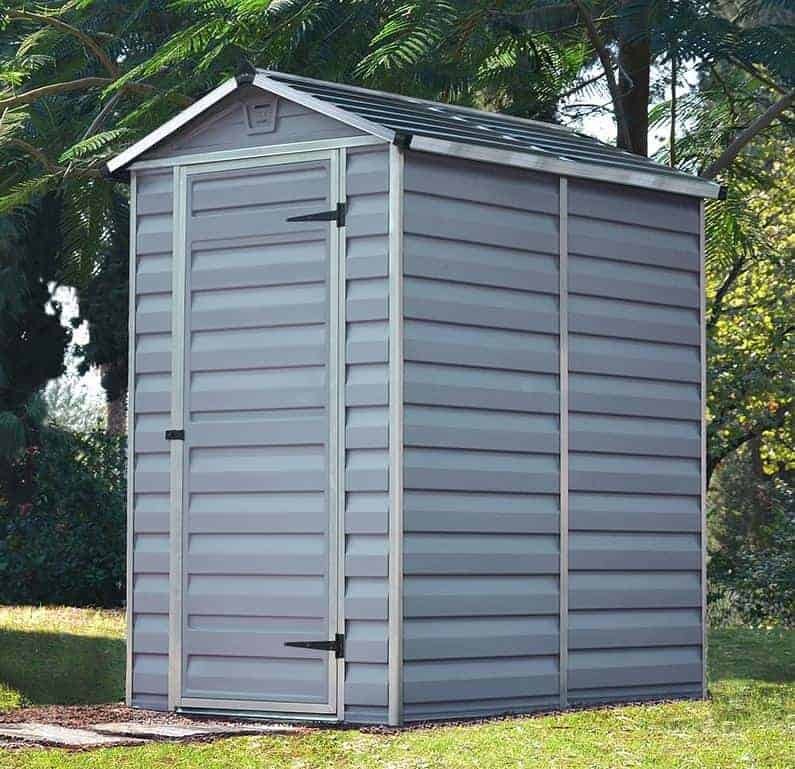 This represents outstanding value for money for a mid sized shed, and it’s this that helps it take the top spot in our fiercely contested league table. Adding even more value to these good looking plastic sheds is the fact that they come with a foundation kit as standard. This makes it easy to create a flat concrete area on which to stand the shed if you don’t already have one to hand. There are no windows, which can be a security boosting feature, so we were pleased to see a skylight included in the centre of the apex roof. If you want a plastic shed with an original look that will turn heads and yet won’t put a dent in your finances, this could be an ideal purchase. We’ve reviewed lots of plastic sheds made by Duramax, and they certainly live up to their name, providing toughness and reliability. 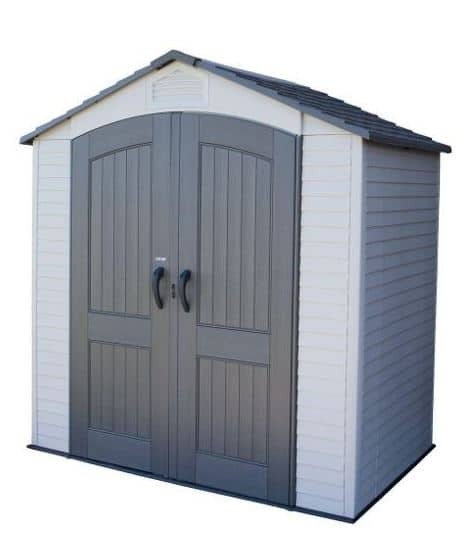 This eight foot by five foot apex roofed model is our pick of the range, however, as it offers excellent value for money thanks to its asking price of less than four hundred pounds, with a 10 year guarantee included. Once again we were pleased to see a foundation kit included as standard as well, and this helps it take the runner position within our WhatShed league table. Style wise, this has a very contemporary look thanks to its ivory coloured PVC cladding. We feel it should fit in particularly well with properties that already have lots of white PVC features in and around their garden, such as fascias, soffits, or a conservatory. We were also impressed by the wide opening double doors, and as the cladding is fire resistant, this should make an ideal all weather store for motorbikes, or as a store for flammable materials such as paints. For lovers of traditional white plastic sheds, this should prove to be a popular choice, and with a strong steel frame supporting the plastic, it should also prove to be much more durable than its decade long warranty period suggests. Palram make a wide variety of garden buildings, so we were glad to find that their six foot by five foot plastic sheds match up to the high quality that we’ve come to expect of them. The first thing that grabbed our attention was the amber colour scheme applied to the polycarbonate panels, and because it’s UV resistant you won’t have to worry about it fading or becoming discoloured over time. 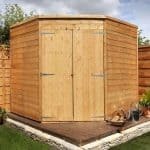 From a distance it has an almost timber like look about it, which is what we think it should appeal to those who normally prefer wooden sheds but who don’t want to have to carry out the maintenance that such sheds usually require. At approximately six foot by five foot this isn’t one of the larger plastic sheds in our league table, but that means that it’s particularly suitable to small to medium sized gardens where lawn space may be in short supply. It also means that it comes with a price tag of under three hundred pounds, making it one of the cheapest sheds in our league table and worthy of a place inside our top three. We particularly liked the integrated skylight, as it means that the interior should be bathed with natural light on a sunny day, making either storage or retrieval of garden items a much easier task. 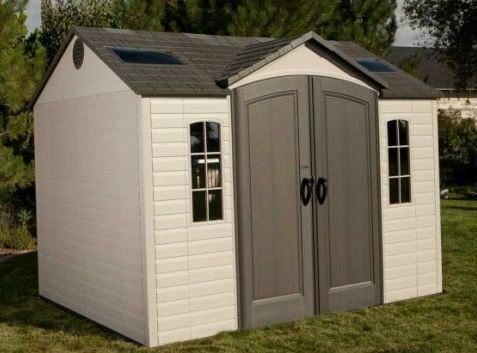 These six foot by six foot apex roofed plastic sheds are among the most attractive that we’ve reviewed. Keter are noted for creating stylish sheds with polypropylene cladding, and this is an excellent example. Although it uses three different shades of grey the overall effect is very eye catching, and we particularly liked the woodgrain effect that has been added to the double hinged doors. Whilst unmistakably plastic in appearance, it’s also a shed that could become a loved and talked about feature in its own right. One thing that instantly differentiates these plastic sheds from the three which are above them in our league table is that it not only has a skylight, it also has a side window. This will likely make the interior very bright and welcoming, so that it’s a shed that the customer would be happy to spend prolonged periods of time inside. It also has two integral shelves, which is a neat and very useful addition. With a 10 year warranty supplied by the manufacturer, and a strength giving steel frame, we feel this should prove to be a very durable as well as attractive addition to the garden, which makes its asking price of approximately four hundred pounds more than reasonable. This is one of the largest plastic sheds to earn a place inside our league table, as we have ruled out buildings with a base area of ten foot by ten foot or above that serve primarily as workshops rather than garden sheds. 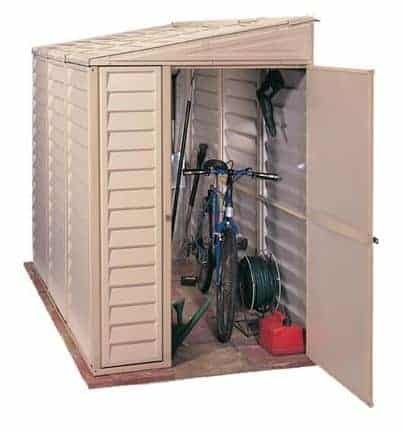 Nevertheless this is more than large enough to serve as either a durable and spacious storage facility for all your gardening equipment, or to act as a place to work for either business or leisure purposes. If you do plan on using it for that purpose then you will need to add an artificial source of lighting as it has, in common with many of the plastic sheds we review, a window free design. This is the second of the Duramax range of plastic sheds to make it into our top five, which shows what a reliable manufacturer they are. Once again we were impressed by how strong and tough the shed should be once assembled, thanks to its strong steel frame. It also adopts the standard Duramax ivory colour scheme, which we appreciate may not be to everyone’s taste, but we liked its contemporary and minimalist styling. In common with other plastic sheds, of course, it requires no painting or maintenance, which are two of the major advantages it holds over a traditional timber shed. Just because you have a relatively small garden doesn’t mean that you have to miss out on the benefits that high quality plastic sheds such as this one from Palram can bring. With a base area of approximately four foot by six foot there’s still enough room inside to store a good selection of garden tools and equipment, and you won’t need to sacrifice too much lawn space. It has a charcoal grey colour scheme which we found pleasing on the eye, and this makes it stand out from most of the plastic sheds we review. What also makes it stand out is a price tag of well under three hundred pounds, and this helps it gain such a lofty position within our league table. As with all the Palram range of plastic sheds it has a windowless design, but that can be a real benefit as it means that passers by will have no way of knowing whether anything of value is being kept inside. Once inside, however, the interior should be well lit thanks to an overhead skylight, which is always something we like to see. It comes with a 10 year warranty, but we wouldn’t be surprised to find that it lasts much longer, and indeed the manufacturer states that it has a 20 year expected lifespan. This is the third of the Duramax plastic sheds in our top twenty league table, and yet it has a look all of its very own. 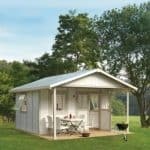 That’s not only because of its size, at four foot by five and a half foot it’s one of the more compact sheds in this guide, but also because it builds upon the stark design usually adopted by Duramax. Whilst there are no doubts about its plastic origin, it has overlap style cladding, and the chocolate brown coloured roof is arranged in a slate pattern. It’s very effective and eye catching, making this one of the most stylish small sheds that we’ve reviewed. Another point of departure for these Woodside plastic sheds is that they incorporate a side window, which is very useful if you plan on working in this shed from time to time. We were pleased to find that unlike most sheds made by Duramax this comes with a 15 rather than 10 year guarantee, adding extra value to its asking price of just over three hundred pounds. 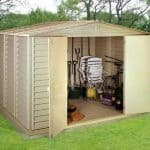 Only its relatively small dimensions prevented this strong and sturdy shed from gaining an even higher position, so if you’re searching for a small yet durable garden shed this could be a smart choice. This is the smaller brother to our table topping BillyOh shed, but we feel that it deserves a place of its own as its five foot by three foot storage area means that it will appeal to a different type of customer, in this case one who has only a small garden or who is looking for an auxiliary shed to go alongside their main one. This is in fact the smallest plastic shed to earn a place inside our top twenty guide, but we were pleased to find that this doesn’t mean that the manufacturer has cut any corners. 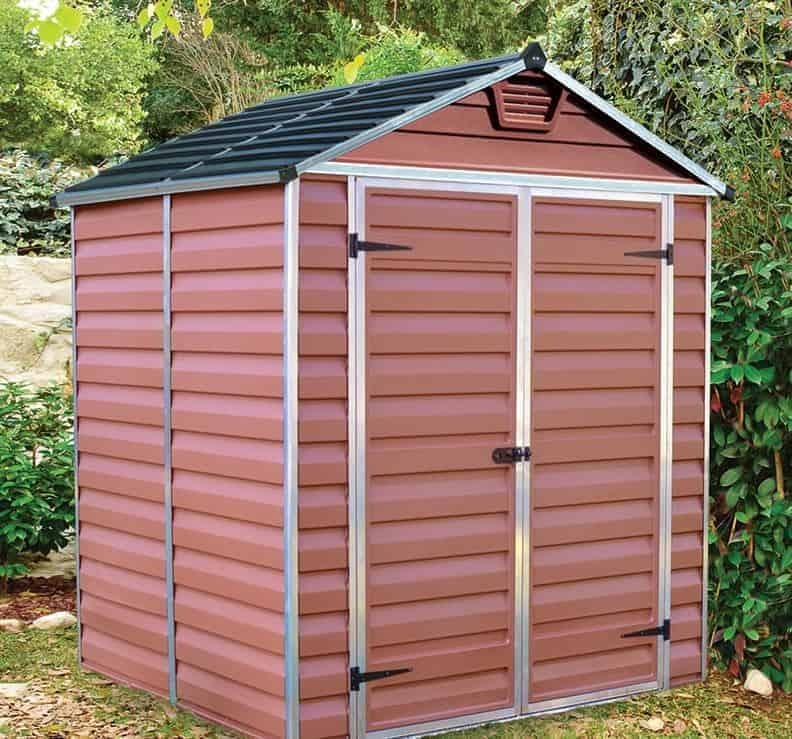 Once again, these plastic sheds have a generous 15 year warranty and have adopt the almost honey like colour scheme that we don’t see from any other manufacturer, and it’s one that we find very visually appealing. We were also impressed with the integrated skylight, and the wide opening double doors which make it easy to move items in and out and means that the customer can make the most of the space that is available. We also welcomed the inclusion of a blow moulded plastic floor, as most plastic sheds that we review are floorless and have to be affixed to a flat area of concrete. This means that the shed should feel reassuringly stable once assembled. These stylish plastic sheds have adopted the classic design of a timber garden shed, with an apex roof reaching up to a very generous peak height of 2.44m and the walls adopting a shiplap style cladding. The difference is that the cladding is white rather than brown, with contrasting grey double doors and roof. We liked this combination of traditional and modern, and of course its major advantage compared to most wooden sheds is that the owner won’t have to spend both time and money carrying out annual treatments and maintenance. Whilst the seven foot by seven foot base area of these plastic sheds puts them firmly in the mid sized bracket, they should feel surprisingly spacious inside. This is thanks to the apex roof we mentioned earlier which is much taller than we usually see on a shed of this size. With the addition of shelving this means that extra vertical storage space becomes available, and there’s should be no need to worry about banging your head when walking inside. There’s one side window as well, which likely helps to make the interior a welcoming environment that’s pleasant to spend time in. This addition of natural light also means that it could be used as a small scale garden office for those who work from home. These seven and a half foot square Fusion sheds are at the forefront of innovation in plastic sheds. Rather than using a purely vinyl or PVC substrate as most such sheds do, these instead use a composite that’s made of a wood and plastic composite. This brings all the benefits associated with plastic cladding, in that it won’t rot or require maintenance on a yearly basis, and yet it’s also more environmentally friendly, which we know is important to many shed consumers. We wouldn’t be surprised to see more composite sheds of this kind appearing in future years. These are not only innovative, they’re also very stylish and good looking plastic sheds. That’s because they have adopted a very convincing timber like colour scheme, with light brown being used for the walls and a darker brown for the double doors and the tall apex roof. We were also impressed with the inclusion of four glass, rather than styrene, windows which is again testament to the high calibre of components used. 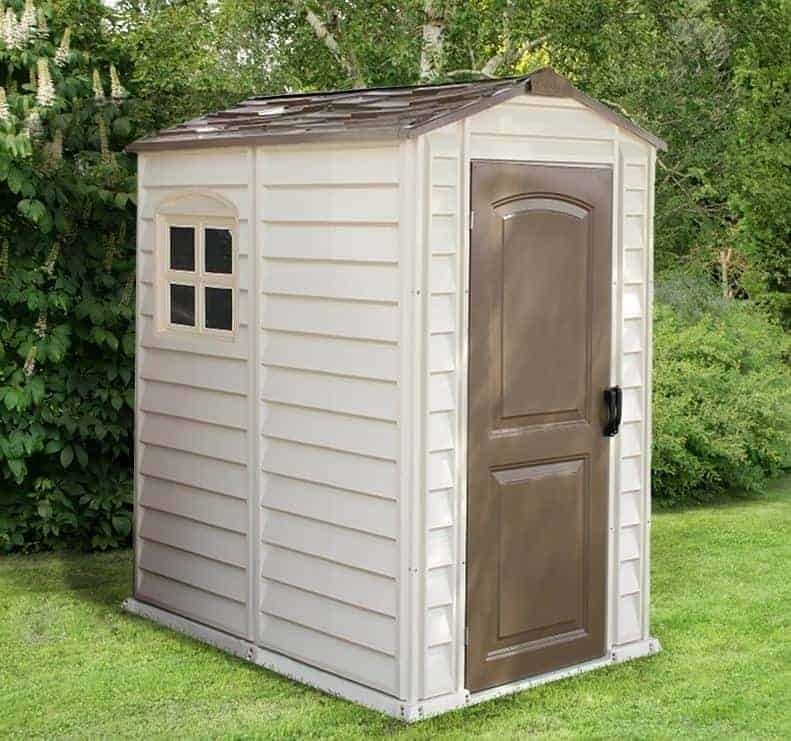 It’s not the cheapest shed of this size that we’ve reviewed, which accounts for its position just inside our top ten rather than the much higher position it could otherwise have occupied, but we feel this is a great choice if you want a wood like shed that provides plastic performance. These plastic sheds have a design that’s shared by no others in this WhatShed league table, and that’s because they have been designed in a lean to style rather than adopting n apex roof as we usually see. This cuts down on the storage area somewhat, but with a base area of approximately four foot by eight foot, and a peak height of six foot, there’s still enough room to store a decent collection of gardening equipment. It also means that it comes at a very reasonable price of less than four hundred pounds, which is given added value by the inclusion of a 10 year warranty. It’s this, and the unique advantages that its design brings, that gain it a place just outside our top ten. Once assembled these plastic sheds should prove stronger than they first appear, thanks to a tough steel frame beneath the weather and UV resistant PVC. The lean to design also gives them added protection and reliability, as the supporting wall shelters them from the worst of the rain and wind. As it can be positioned on a patio, or next to a house wall, we also think this is an ideal storage facility for people who have very little lawn space available on their garden. 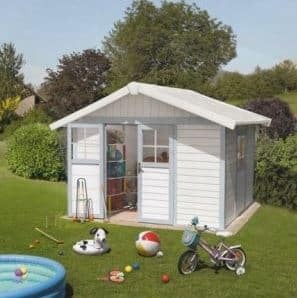 We’ve reviewed plastic sheds in all sizes and colours, and this Avon shed definitely stands out from the crowd. For starters it comes in an olive green colour scheme. We found this visually pleasing, and it should blend in well to a traditional garden background. For that reason we think this should prove popular with consumers who want a plastic shed that doesn’t look too obviously plastic in appearance, or who want a well sized garden shed that’s both practical and unobtrusive. The other thing that caught our eye when reviewing these plastic sheds was their depth of approximately twelve foot. This makes them by far the deepest of all the sheds to feature in this league table, and yet because they are only six feet wide they still meet our criteria of only considering sheds with a base area of less than eighty square feet. You really can fit a lot inside these sheds, and because the substrate is naturally fire proof we can imagine it being used as an all year round storage facility for motorbikes. This is a good choice for people with narrow and yet long gardens, and with a 10 year warranty included we feel that it also represents reasonable value for money. As we’ve seen earlier in the league table, we like both the practicality and aesthetic appeal of the Woodside range of plastic sheds from Duramax, although they may not appeal to people who don’t like sheds that are predominantly white in colour. This is the eight foot by six foot model which we feel makes it much more versatile, as although it doesn’t take up too much space in the garden it’s large enough to be used as a home office or even as a small scale workshop for a hobby or craft pursuit. It also comes with a larger price tag than the compact model we looked at earlier, however, which accounts for their relative positioning within our league table. The first thing that caught our eye when we saw these plastic sheds were their wide opening double doors. They come in a chocolate colour that contrasts nicely with their surroundings, and they make it easy to move wide or bulky items in and out. What we particularly liked about them was that they are supplied ready assembled and simply hook onto the hinge pins on the door jambs. 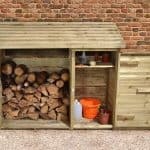 This should make installation a much easier and quicker process than it could otherwise be, which is why this shed is ideal for those who’ve never assembled a garden building of this size before. Many people acknowledge the benefits that plastic sheds can bring, in terms of their durability and low maintenance, and of course they are also free from the threat of rot or rust, and yet are put off from buying one because they feel that they lack style or originality. 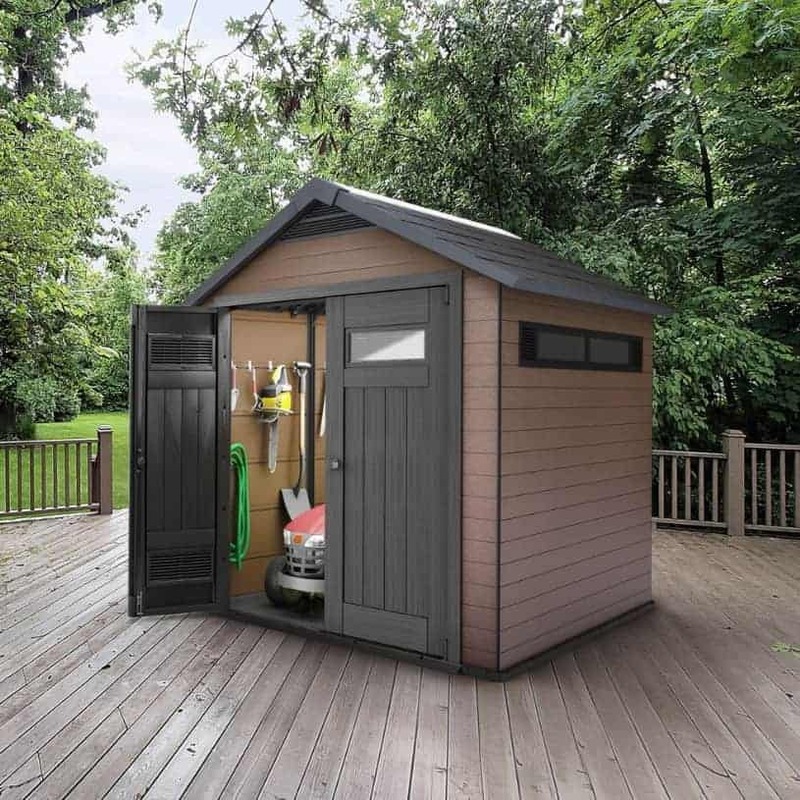 These utility sheds from Grosfillex certainly disprove that theory, as they are among the most attractive sheds that we’ve reviewed in any substrate. We were really struck by the pastel blue and white colour scheme, and by the practical and aesthetically pleasing overhanging apex roof. This is a shed that’s sure to get your neighbours and friends talking for all the right reasons. These are also among the tallest plastic sheds we’ve reviewed, with an eaves height well in excess of six foot. We also liked the fact that the double hinged doors have glazing at the top of them, this negates the need for side windows which can be a boost to the shed’s security. Another security boost is the inclusion of a key operated lock, which is something we always welcome but rarely see on a plastic shed. With a 10 year warranty included as well, only the high asking price prevents this from gaining a place in the top half of our league table. These plastic sheds from Suncast put a smile on our face from the moment we saw them, and they have a look of quality that belies their very reasonable price tag of less than nine hundred pounds. Both the double doors, the two windows on these doors, and the side window have been given a curved top, which really catches the eye. We also liked the way that the shed uses three colours, white for the walls, light grey for the door, and slate for the apex roof. The iron style door handles also help to give it a touch of elegance. 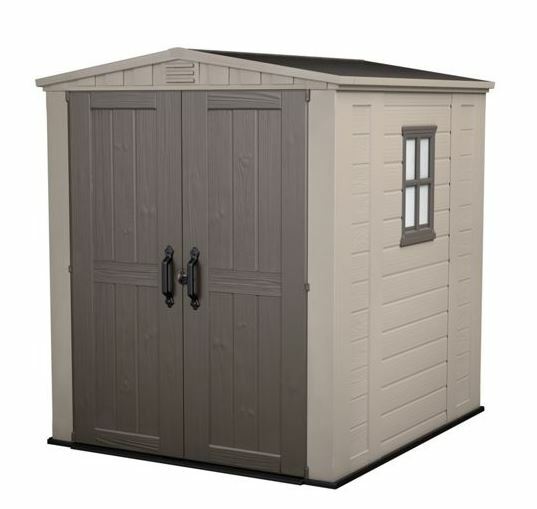 These seven foot by seven foot plastic sheds are not only good looking, they’re strong and reliable too. The manufacturer has supplied a 10 year guarantee, but we would expect them to prove much more durable than this suggests, especially as the cladding is made from double walled blow-moulded resin. In effect this means that it’s twice as thick as most of the plastic cladding we see, so we feel this would be a good storage solution for gardens that are in open and exposed areas that are often subject to strong winds. 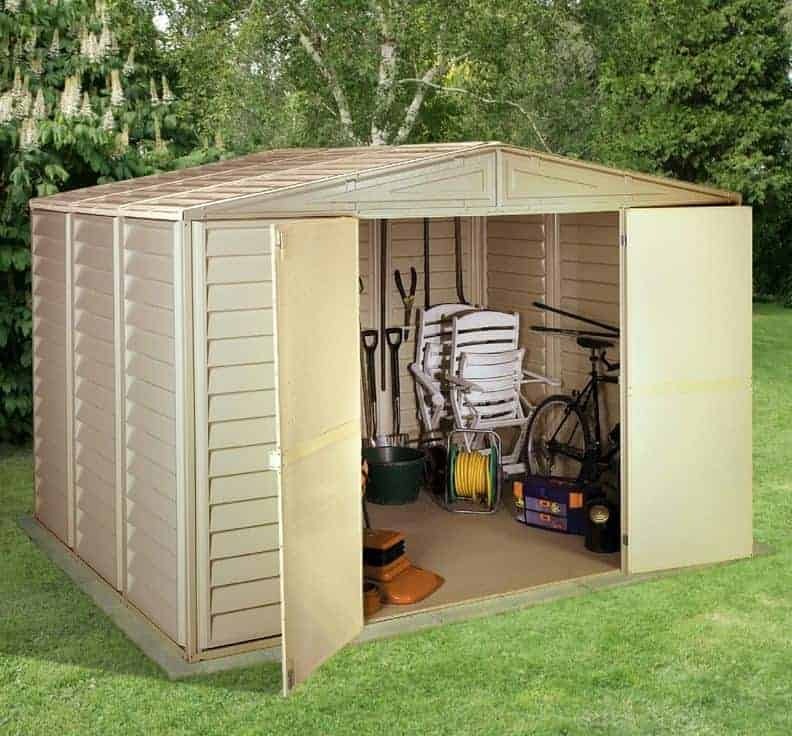 We were also pleased to discover that it comes with a reinforced floor, meaning that you won’t have to worry about storing heavy items inside this shed. 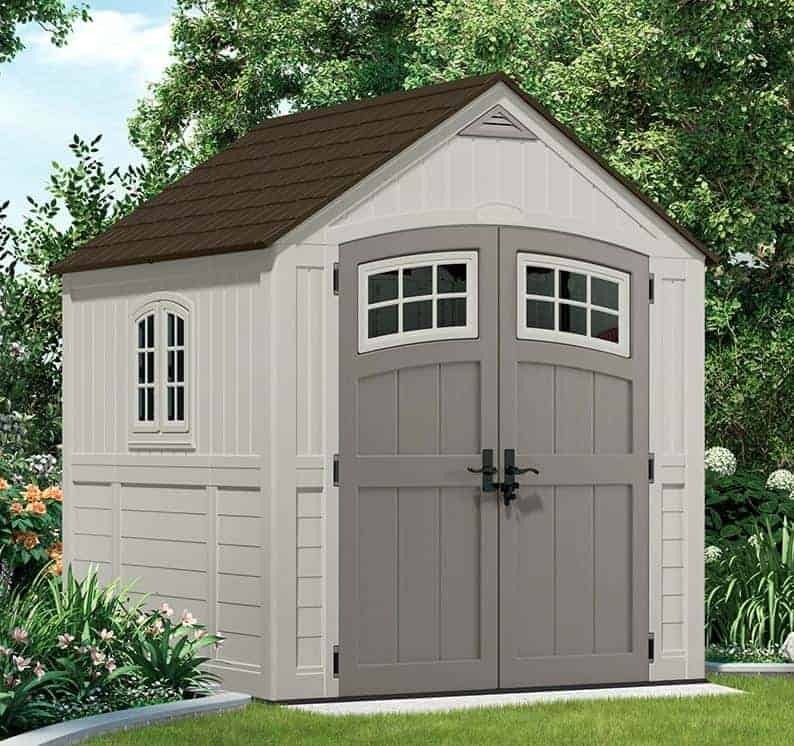 These white and grey plastic sheds from Lifetime have a unique look all of their very own. They are much wider, at 2.39m, than they are deep, at 0.71m. This gives them a sentry box like appearance, but it also means that they are ideal for people who want a good looking and high quality garden storage facility, and yet only have a shallow lawn on which to position it. Despite their shallowness, we were impressed by just how much these plastic sheds can hold thanks to their wide frontage and relatively tall apex height. 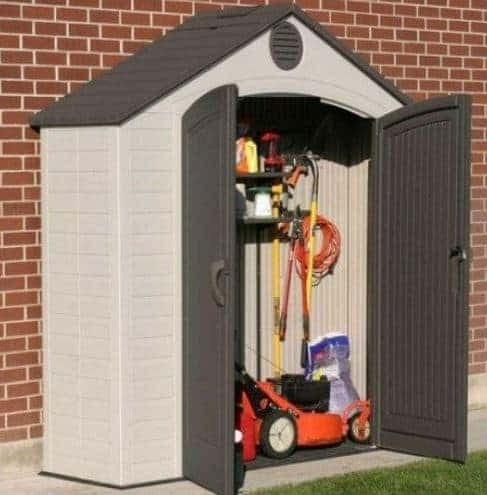 For example, it’s possible to fit a standard sized lawn mower in here and still have room for a good selection of garden tools and accessories. The double doors should make access very easy, and we particularly liked the way that the doors are curved at the top. This is purely a stylistic flourish, but we always like to see little additions that help to raise a shed above its competitors. There’s one small skylight in the roof, but this should still provide enough light to see by, especially as the interior will likely be flooded with light whenever the doors are opened. We would have liked to see it priced a little lower, however, which is why it takes a place in the bottom half of our WhatShed league table. Green plastic sheds such as this one always catch our eye because they stand out among the majority of white tinged plastic sheds we usually see. Paradoxically, however, they can also blend nicely into a garden full of greenery and foliage, so you won’t have to worry about having a plastic shed that stands out for the wrong reasons. 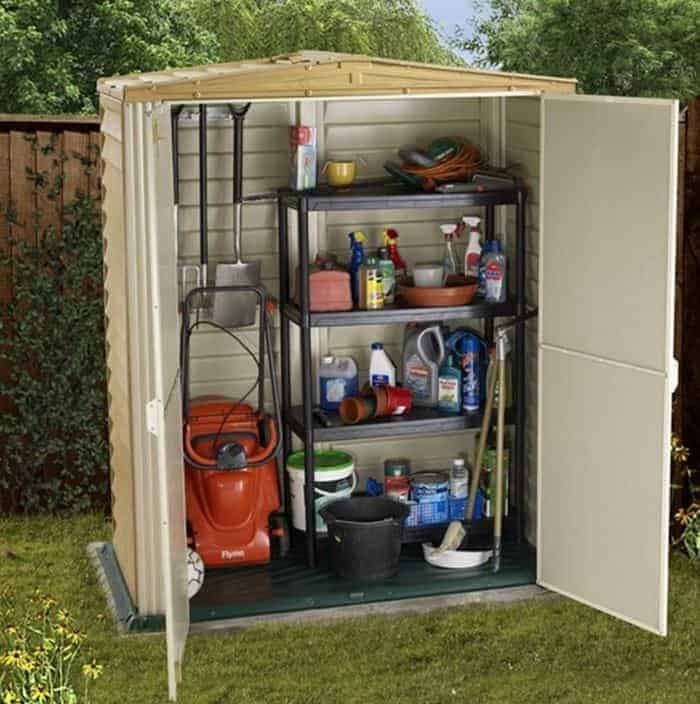 With a base area of just six foot by three foot this is one of the smaller plastic sheds that have gained a place within this guide, although there are of course even more compact, and portable, sheds out there for people who need a small scale storage solution. 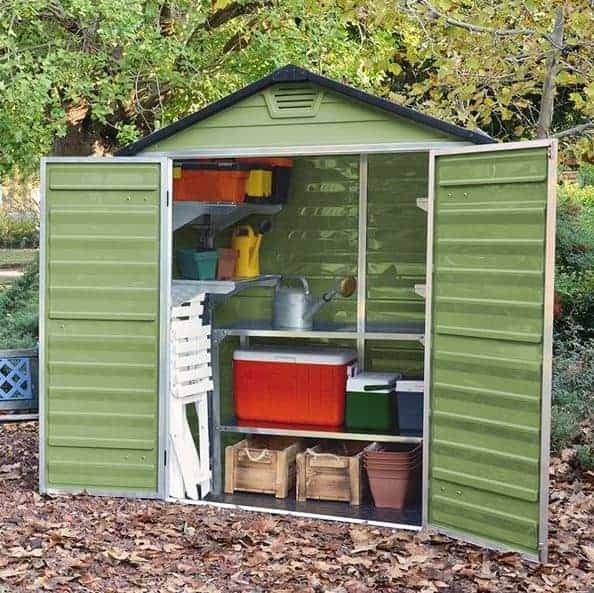 This is also by far the cheapest shed here, costing not much more than two hundred pounds, and it’s this that gains it a well deserved place inside our top twenty. 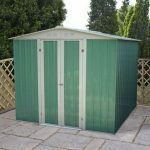 The compact size of these plastic sheds also makes them lightweight and easy to assemble, which is another advantage that plastic sheds have over both timber and metal garden buildings. We were impressed by how much light should be let in by the translucent roof panels, and also by the inclusion of a slip resistant floor. This can come in especially useful if you walk inside from a wet or muddy garden, providing a safer environment to move around in. 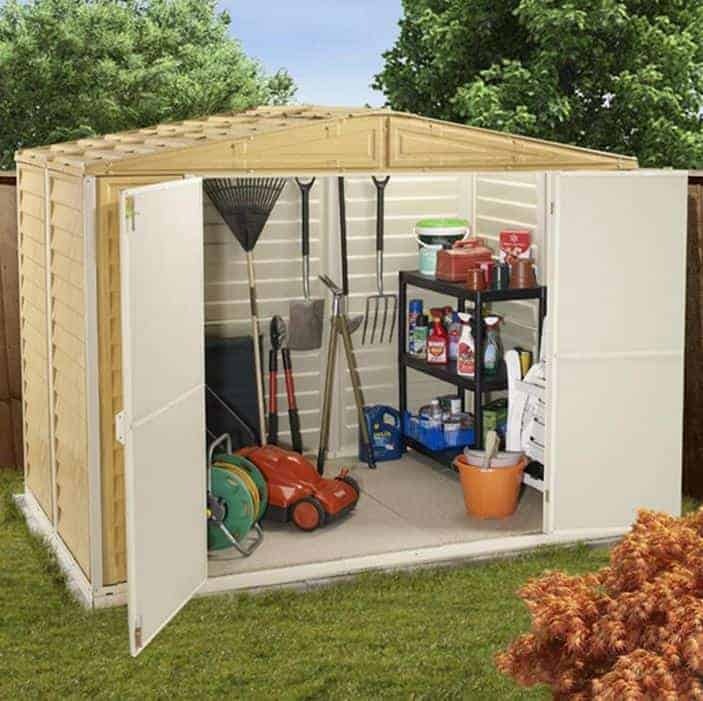 If you have a small garden, yet take great pride in keeping it in good shape, then a seven foot by four foot garden shed should meet all your needs, and these plastic sheds from Store More are a great example. They have the very stylish arched double doors that we’ve come to associate with this manufacturer, and thankfully they’re still large and wide enough to move items such as lawn mowers in and out with ease. One difference about this model compared to others in the range, however, is that it features no windows. This is a positive point if shed security is one of your main concerns, and we were pleased to find that it’s easy to affix a padlock, which will need to be bought separately, to the handles. Even without windows the interior of these plastic sheds should be far from gloomy on a sunny day, thanks to a full length skylight secreted in the dark grey apex roof. There are also two corner shelves hidden away inside, which is a useful and money saving addition. With a 10 year warranty and tough double walled plastic cladding this is a shed with a lot to recommend it, but the higher than average price keeps it towards the bottom of our league table. These are the largest of all the plastic sheds to feature in our WhatShed top twenty league table, and both their size and appearance greatly impressed us. The manufacturer has not simply taken a standard apex roof design and made it wider and deeper, they have instead created a unique look that we found very striking. Its beauty comes from its symmetry, with a centrally positioned double door having its own projected apex covering at right angles to the main roof. On either side of this door are a long and thin window with a curved top and Georgian style decoration, and the overall effect is stunning. The two front windows aren’t the only source of natural light on these plastic sheds, as they also have an additional window, which we were pleased to find could be opened to allow extra ventilation in, and six skylights of differing sizes. It means that this is most likely going to be the best illuminated plastic shed that we’ve reviewed, and this is a real bonus as the shed is also large enough to work inside. Only the large price tag prevents this very versatile shed from being placed much higher up our league table, so if this falls within your budget then you may want to make it one of the first sheds you consider. This is the second of the Deco range of garden buildings to make our list of the twenty best plastic sheds that can be bought online today. Whilst it is larger, it’s also the most expensive shed within our league table, and this is why it occupies the final position even though it has a lot to offer consumers who can afford it. Looks wise this still uses the pastel blue paintwork that we liked so much on their utility shed, but on this occasion white is the predominant colour with blue used for trim and detailing. Nevertheless, we still found this one of the most visually striking plastic sheds that we’ve reviewed, and it’s even possible to swap the pastel blue for a pastel green colour, which we feel is a nice touch. The windows are larger on this model as well, which is useful in a shed of this size as it means that there should be enough natural light to work by, whether that means at a computer in a garden office or at a craft activity in a workshop. If you plan on storing computer equipment, or other valuables inside this shed, then you’ll be pleased to know that the double hinged doors have a key operated lock, making them considerably more secure than most plastic sheds that we’ve reviewed.